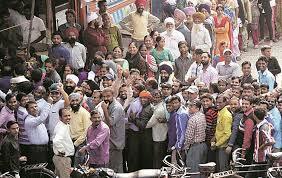 Demonetization of the high valued currency notes of Rs.1000 and Rs.500 by our PM Narendra Modi on November 8, 2016, has gripped the country with a severe problem of cash crunch or cash crisis. All banks and ATMs have gone cashless and people are left with no money at all to meet their daily requirements essential for the everyday existence. Poor people with no knowledge of online transactions or e-payments are the worst hit. They had to depend on the mercy of vendors and traders who could offer them their daily essentials on credit. The media and the political parties have expressed their own views and launched much criticism of the step taken by our PM Modi and our central bank RBI in their varying comments and at public meetings. Many of them opined that it was the result of the lack of proper planning and foresight on the part of Reserve Bank of India and our Government. But, they didn't think of the circumstances that lead to taking such a sudden step overnight by our PM. I appreciate the bold move taken by our government even though most of us had to face many difficulties in coping with our daily necessities due to the lack of cash. I thought of presenting my own opinions here in this regard and to offer my own suggestions to tackle the situation in a better manner. How to tackle the problem of the cash crunch in our country? 1) First of all, I would like to suggest that RBI should not release all the amount of withdrawn currency notes that they print. They should print only 65% of the withdrawn currency as advised by some thinkers of the economy. Even after printing the 65%, they should make available only half of the notes to be circulated again among the public. So, only up to 35% of the total withdrawn currency should be in circulation and the balance 30% should be kept in reserve for emergencies with RBI and not with the commercial Banks. Suppose that the total demonetized notes were as follows according to some reliable reports in media. RBI sources informed according to a media report published in the economictimes.com dated 19/12/2016 that as on 8/11/2016, RBI had printed 2473 million pieces of Rs 2000 denomination notes before announcing the demonetization. The value of those notes amounts to Rs 4.946 lakh crores. So, RBI already had a fund of Rs 4.95 lakh crore to meet the demonetization effect. Now, if RBI should print only 65% of the demonetized value of notes, it should print (14.95 lakh crore x 65% = Rs 9.72 lakh crore value of the currency. But, we already have Rs 4.95 lakh crore in the shape of Rs 2000 notes. So, we need to print only (9.72 less 4.95 = 4.77) Rs 4.77 lakh crore value of the currency. If all this value of the currency is printed in the shape of Rs 500 notes, we need to print 954 crore notes. According to these same reports, the currency printing machines have a capacity of printing only 7.4 crore notes a day in their present working conditions of two shifts per day. So, to print 954 crore notes, it will take (954 divided by 7.4) 129 days roughly or say 4 months. If RBI started printing the notes from 1st December itself at this rate, the notes will be ready by 8th April 2017. So, we have to bear another 3 months till the position improves. 2) Establishments and business companies should disburse only Rs.10,000 in cash as salaries and the rest amount should be credited to the bank accounts of their employees. This will control the cash shortage by limiting the cash in the hands of people. As of now, our population is around 134 crores. So, if RBI is printing a total of 972000 crore value of the currency (9.72 lakh crore value including Rs 2000 notes), each individual including the just born child will be having a sum of Rs 7250 with him for immediate needs. This is excluding the other notes of Rs.100, 50, 20, and 10 denominations. So, if a family has 4 members, it will have roughly Rs 30,000 with them. This is too much for meeting your cash transactions. That is why I advocate for releasing only half of the printed currency for circulation among the public. 3) Banks should allow only a maximum of Rs.20,000 as cash withdrawals and nothing more than that limit during any month excepting some special cases where it is necessary. 4) Government and Banks should provide safer and quicker means of making cashless transactions. 5) I think all people should open savings or other current accounts with Banks and get their ATM cards. These ATM cards can be used very safely for making any kind of payment with no threats of security if properly maintained. 6) Mobile apps can also be taken to make other transactions but they should be properly guarded. 7) Public awareness should be promoted to educate people regarding the various types of safer apps and tools available for going cashless and regarding their proper usage with public demonstrations conducted throughout all the corners of the country.